With the French Open slated to begin soon, tennis lovers of all ages will be glued to their television sets. But, before the commencement of this major tennis tournament, there is another tennis tournament going to be held at the Ravine Hotel, Panchgani, exclusively for kids less than 14 years of age. The event is organized by the Ravine Hotel under the auspices of the Maharashtra State Lawn Tennis Association (MSLTA). Ravine Hotel is a preferred location for most families keen on a vacation. But, most of them are not aware that this hotel, located among the beautiful valleys of Panchgani, has a tennis court with state-of-the-art facilities, making it a perfect choice for hosting a tennis tournament. 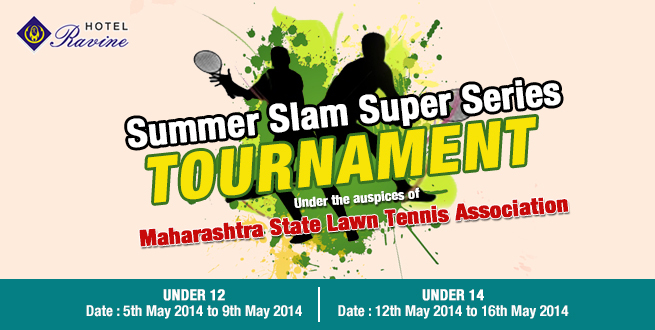 MSLTA is an esteemed organization based out of Mumbai for conducting major tennis tournaments across Maharashtra. Officials of the Ravine hotel and MSLTA ensure that the games played in the tournament are on a fair basis and in accordance with the rules. Kids keen to learn tennis as a hobby or wanting to pursue it as a career can make use of this opportunity to hone their skills. The event also gives under-14 kids a chance to exhibit their talent. Parents and other family members accompanying the kids to cheer for them also get an opportunity to appreciate the breathtaking view of the valley. Parents should encourage their children to take part in such competitions to help them polish their skills. Who knows, your kid may turn out to be the next Leander Paes or Sania Mirza, representing our nation at international levels and making India proud! The tournament for under-12 kids will be held from 5th to 9th May. The last date for the entry in this category is 14th April 2014, 5.00 PM. The matches for the under -14 group will be held between 12th and 16th May. The last date for the entry in this category is 21st April 2014, 5.00 PM. The success of the tournament means a lot to everyone at Ravine Hotel. Everyone is proud to have put through a great show for the players and the spectators so far, and they are also confident about doing better with each coming tournament.